The fourth and last child of Max and Kitty Kaminsky, Mel Brooks was born on his family's kitchen table in Brooklyn, New York, in 1926, and was not quite three-years-old when his father died of tuberculosis. Growing up in a household too poor to own a radio, Mel was short and homely, a mischievous child whose birth role was to make the family laugh. Beyond boyhood, after transforming himself into Mel Brooks, the laughs that came easily inside the Kaminsky family proved more elusive. His lifelong crusade to transform himself into a brand name of popular humor is at the center of master biographer Patrick McGilligan's Funny Man. In this exhaustively researched and wonderfully novelistic look at Brooks' personal and professional life, McGilligan lays bare the strengths and drawbacks that shaped Brooks' psychology, his willpower, his persona, and his comedy. McGilligan insightfully navigates the epic ride that has been the famous funnyman's life story, from Brooks's childhood in Williamsburg tenements and breakthrough in early television—working alongside Sid Caesar and Carl Reiner—to Hollywood and Broadway peaks (and valleys). 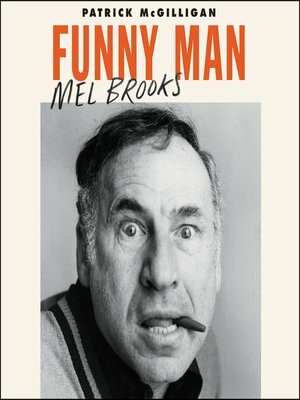 His book offers a meditation on the Jewish immigrant culture that influenced Brooks, snapshots of the golden age of comedy, behind the scenes revelations about the celebrated shows and films, and a telling look at the four-decade romantic partnership with actress Anne Bancroft that superseded Brooks' troubled first marriage. Engrossing, nuanced and ultimately poignant, Funny Man delivers a great man's unforgettable life story and an anatomy of the American dream of success.